Season 2 Beyond Babel | c3 Communications, Inc.
Due to popular demand and the successful inaugural run, BEYOND BABEL is returning to San Diego for a second season. Named top “18 Things We Loved in the San Diego Arts Scene in 2018” by The San Diego Union Tribune, BEYOND BABEL will begin performances in San Diego with a two-month run February 1 – March 30, with evolving creative including new moves, new crochet, and the same heart. The production is told entirely through the style of West Coast Urban Dance in their purpose-built theater space, called the Beyond Babel Theater (2625 Imperial Avenue, San Diego CA 92102), near Downtown San Diego. Tickets are on sale now www.BeyondBabelShow.com. 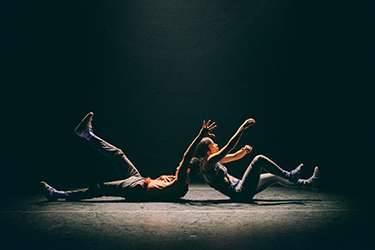 BEYOND BABEL, told entirely through West Coast Urban Dance, is inspired by the classic tale of Romeo & Juliet and current social stories from all over the world. It takes place in a city where there is tension between two neighborhoods separated from one another by a wall. The plot follows two star-crossed lovers who meet one fateful night at a party on the border, and after being separated by the authorities, must overcome their circumstances to be together. The show is set to a contemporary soundtrack and is about the division of families, friends, and a community of people as authorities decide to build a wall between them. It is an immersive dance show where the seats move throughout the production to give an intimate theatrical experience. Keone and Mari Madrid are best known for their appearances on “So You Think You Can Dance”, “Dancing with the Stars” and “World of Dance” And they are huge YouTube sensations with video views over one billion times. Hideaway Circus is no stranger to successful productions having an on going show at Bally’s Casino in Las Vegas called The Miss Behave Gameshow. They all have come together bringing their unique style and passion to Beyond Babel which is why this show is so impressive.